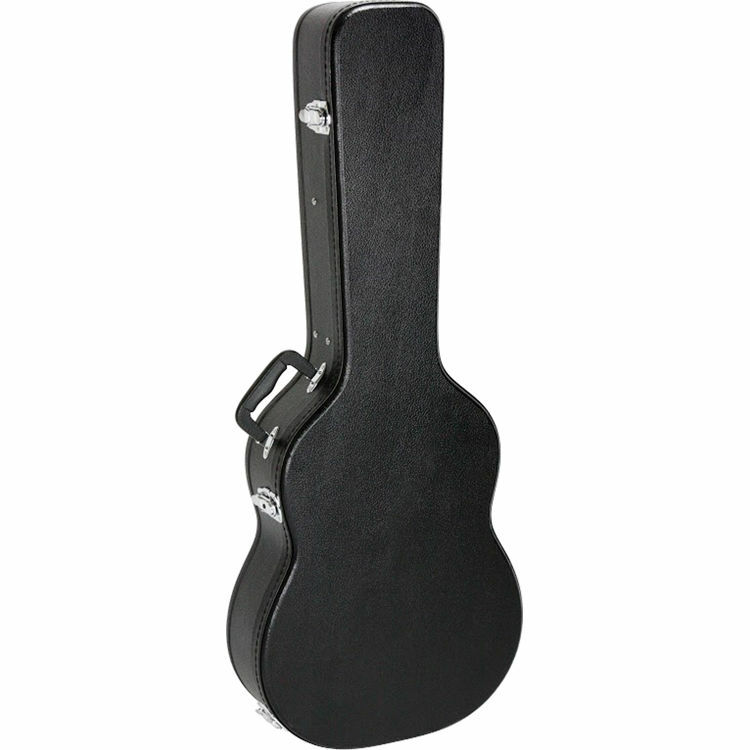 Featuring hardshell plywood construction and a durable PVC covering, this KACES Economy Guitar Case protects dreadnought-sized acoustic guitars during transport and storage. The interior of the case is plush lined and padded, and has a neck block to secure the instrument, while an interior storage compartment can hold essential accessories. Latches, hinges, and feet are all chrome plated to complement the black exterior. Economy Hardshell Guitar Case for Dreadnought Acoustic Guitar is rated 4.8 out of 5 by 9. Rated 5 out of 5 by Anonymous from Excellent Product The Economy Hardshell Guitar Case for Dreadnought Acoustic Guitar exceeded our expectations for quality. Very nice case for the money. My son was thrilled with it!! Delivery time was also exception! Received 3 days after placing my order. I will definitely order from this company in the future!! Rated 4 out of 5 by Dale from Well worth the price Very nice well-built case, nice velveteen fabric /with padding inside the case. I do prefer the fleece type lining over this particular type,but all in all I am pleased with the case and do recommend the product to others. Very pleasant buying experience..fast shipping! Rated 4 out of 5 by Stephen L. from A nice guitar case. This is a nice guitar case for the money. It looks good, seems to be sturdy and had a lot more padding than I was expecting. My Fender CD 140S just barely fits. Rated 5 out of 5 by Edward from Great Hard Shell Case Okay I have to admit I was very skeptical when I ordered the case. It was very inexpensive for a hard shell case so how could it be any good? I was wrong! It's a great case. made very well. Padding is terrific. Lockable. Probably as good or better than my original Takamine hard shell case that cost a great deal more. Don't be afraid to buy this case based on it's price. Rated 5 out of 5 by CLK from Excellent Value Needed a replacement case for my 35 year old Yamaha dreadnought guitar. Thought I would try this reasonably priced case based on other reviews. Excellent fit and quality. Would buy again. Rated 5 out of 5 by Andrew from Unbelievable Deal!! Great case at an unbelievable price. At this price buy 2!! It shipped fast. Definitely recommend the case and B and H.
Rated 5 out of 5 by Elliesue from GUITAR CASE Ordered an acoustic guitar case. The case was much more than I expected and at a very reasonable price. Rated 5 out of 5 by GeorgeS from Perfect low budget case This case is a great bargain and seems to be built well! I'm looking for a hardshell case for an Ovation Elite acoustic electric. It has a deep bowl so that the interior of the case must be 6 . Any ideas on what will work? The interior is designed to accommodate guitars which are less than 5 deep. You may need to look for a jumbo style case. We currently do not offer a hard case with suitable dimensions to accommodate a 6 bowl. Are the dimensions for inside or outside of the case? Good morning. What are his external measures? my guitar measurements41-1/2 in. OAL. 4-7/8 in deepbridge side of body is 15-5/8 in.neck side of body is 11-5/8 in. Would a Carlo Robelli F-600CE BS Dreadnought Cutaway Acoustic-Electric Guitar fit in this case? Don't know about your specific guitar fitting, but be careful with this case. My Yamaha FG830 dreadnought did not fit, and I had to return the case. Could this fit Yamaha GigMaker Standard Acoustic guitar? Not sure about the Yamaha. My Gretsch 5420 fits perfect. Check your guitar dimensions against the Gretsch.